Enjoy this excerpt from my book, “The Space Between – An Inspirational Tale of the Journey out of the Ego-Mind and into Spirit.” The following is from Chapter 23: The Way Home. It was a very important message from my guides – one that was meant to be shared with you. It is for us all. One Sunday, on my way back home from visiting my family, I was meditating, when I received a most beautiful message. It was one of the most important insights I’d received yet. It was stunning in its simplicity, breathtaking in its beauty, and it invoked the most profound appreciation and gratitude I’d ever felt. I’d like to share this with you, because this message was not only for me, but for all of us. This is also for you. You are unique in all creation. 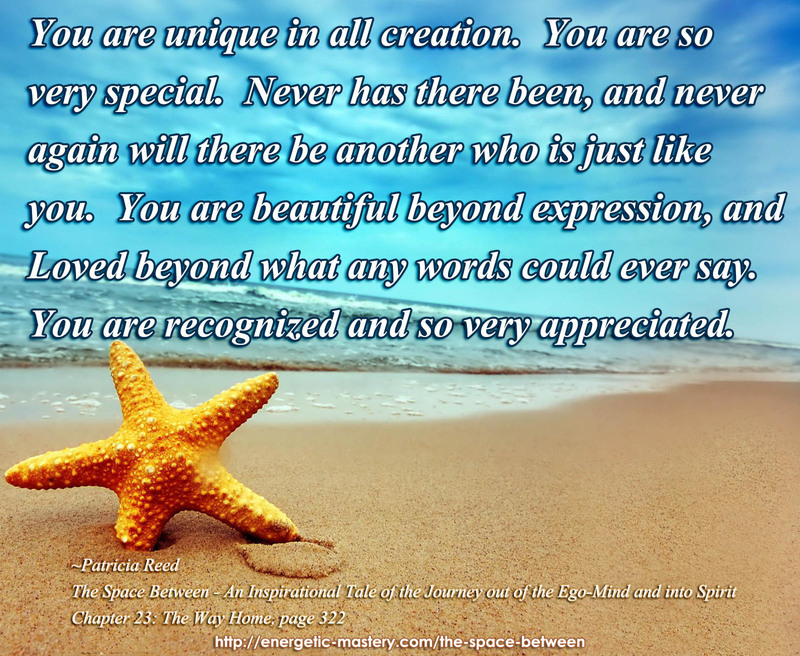 You are so very special. Never has there been, and never again will there be another who is just like you. You are beautiful beyond expression, and Loved beyond what any words could ever say. You are recognized and so very appreciated. Your soul very much wants to live through you, free of the ego-mind’s delusions of suffering. There is no one else like you, and all that is asked is for you to acknowledge Who You Really Are, so that you may live in Truth for as long as you are here. Would you deny your own soul this wish, and remain instead as a slave to the ego-mind’s suffering? You have no idea how special you truly are, as long as you remain in the darkness of illusion. Never again will your soul have the opportunity to live as you. Our souls come back again for as long as we dream, but you will never again be exactly as you are right Now. Life greatly desires to be lived by You right Now, in the Space Between. You are Life. If you are not allowing your True Self to live through you and as you, you are not really living. Feel Your Truth, feel it in your Heart. Be the Real You – right here, right Now. Feel Consciousness. Feel Spirit. Feel Source. Feel it in your entire being – all of your energy bodies – feel your Love and Light surging through your entire body-mind. Feel Your Self. Know Your Self. Cherish this very moment, regardless of what appears to be going on in your outer reality. Cherish every person around you, for as you will never be exactly as you are now, in this form that you inhabit, neither will they. The Universe is ever changing. Appreciate all that is, in this very moment, for the next time you look, it is different, never to be exactly the same, ever again, for as long as the dream of life goes on. Appreciate the uncertainty you perceive, even as you know that in Spirit, all is certain, and what is certain is that everything you perceive around you shall pass back into the nothingness from which it came. Do not focus on what is outside you, but rather appreciate it, without resistance or conditions upon it. Any change that can be made there happens from within the Space Between. Your very soul is unique, so be Present within your Heart and pay attention to the desires that show themselves to you. Whatever you do, do it from your Heart, and be Present, fully focused on your doing from your True State of Being. As you begin to perceive your life circumstance differently, your outer reality begins shifting to match your Being, reflecting back to you all that which you are projecting. Be the Love and Light and Joy and Peace that You Truly Are. Don’t wait for something outside you to look better before you enjoy your life. Be Your Truth Right Now. Thank you. I read this and cried. I needed to hear this right now on my journey. Thank you.